"I worship Peryite, yes, because sometimes the world can only be cleansed by disease." Kesh the Clean, a Khajiit spellsword, is a worshipper of Peryite who can be found at the Shrine to Peryite. If you are at least level ten, he will give you the list of items you need in order to speak with Peryite, and thus begin the Daedric quest The Only Cure. He spends much of his time working at the alchemy lab present at the shrine. When he is not working on his Alchemy, he can be found cooking at the nearby cooking pot. He sometimes stops for a meal or drink, though he does not sleep as he lacks a place to bed down. 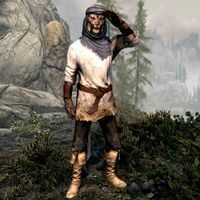 Kesh wears a set of miner's clothes, a pair of gloves, a pair of boots, and an Alik'r hood. He is equipped with two leveled daggers, both of which can be up to Daedric quality. He also carries a leveled staff. Once you have reached level ten, you may encounter an Afflicted refugee in your travels. If asked, he will say he is fleeing to High Rock, and as he is in a hurry, he will direct you to Kesh: "Kesh could tell you more. I just want out of Skyrim as quickly as possible." Upon greeting Kesh himself, he will wonder, "Ah, a wanderer, yes? No? Pilgrim, perhaps? You have come to commune with Peryite, Taskmaster and blighted Lord, yes?" When asked about Peryite, he will say, "He is the pus in the wound. Oh, proper ones curl their noses, but it's pus that drinks foul humors and restores the blood. I worship Peryite, yes, because sometimes the world can only be cleansed by disease." You may commune with Peryite if you gain Kesh's approval first. If you have not reached level ten, he will refuse to help: "Ah, no. Don't think you've got the stuff. Come back when you've seen a bit more in life, perhaps." Otherwise he will agree and explain, "Not everyone has the stomach required to entreat my Lord. But Kesh likes you, friend. There is a way Peryite may speak to us who will take Him in. If you wish to commune with Him, we'll need the incense." If you ask him for more detail, he will elaborate: "Yes, the incense. Fetch for me a deathbell flower, one silver ingot, a flawless ruby, and some vampire dust. Then I will show you how." He will also give advice on where to find these ingredients: "This one would try a shop. You might prefer the direct route, hm? Deathbell grow in the frozen tundra. You might nip into a mine for the ruby and silver. Vampire Dust is tricky. Vampires, you know." When you bring Kesh the ingredients for the incense, he will say, "Ah, have you? Let Kesh have them." He will walk to the cauldron, commenting on the ingredients: "Yes, yes. This will create a fine fume." Once the incense is ready, he will tell you, "That should do. Now - Inhale deeply." Upon doing so, your vision will blur as ghostly skeevers appear before you; they are an aspect of Peryite, who will command you to enter Bthardamz and kill Orchendor, his traitorous worshipper. After the aspect fades, you may ask Kesh where Bthardamz is. He will mark it on your map and say, "Not far, not far. This one looks upon it on clear days. Look to the west, at the foot of the mountain. The Dwarven ruins there. Bthardamz." When asked about Orchendor, he will respond, "Orchendor? Kesh knew him. He's an Overseer. Shepherd. Gathers the Afflicted, contains the festering wound. Orchendor and his Afflicted are meant to stand ready, awaiting Peryite's command to cover the world with his Blessing." If you speak to Kesh after killing Orchendor, you can seek his permission to commune with Peryite again and report on your success. Kesh will tell you, "The vapors are waning, but not yet gone. Take a breath. Peryite will speak if He sees fit." This page was last modified on 9 July 2014, at 14:19.